It turns out there’s a cult following of Michelle Cooper’s Montmaray Journals series. Now, I’m one of them. The audio version of A Brief History of Montmaray took me across several states (and back). Sometimes I was so engrossed that I didn’t notice how low the gas gauge was – a lack of attention that can be dangerous on some stretches of South Dakota highway. It’s written as the secret diary of (Princess) Sophie FitzOsborne, one of the ruling family of the island kingdom of Montmaray. 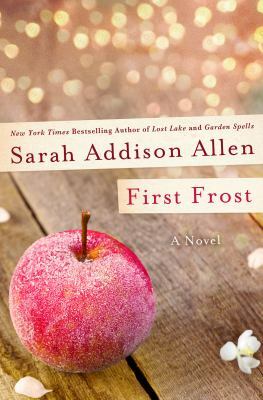 Sophie’s view of herself, and her family evolves as she learns more of the tragedies surrounding her family’s history, including her aunt’s disappearance. The cast of characters include her very eccentric Uncle John (the king), her siblings and cousin – all with their own obsessions and quirks. There’s a secret language that the cousins have developed – she encodes parts of her diary in this language, in case the book falls in the wrong hands. There are also secret tunnels, the possibility that the crumbling castle may have connections to the Holy Grail, a jeweled egg gifted by the Romanovs, and perilous rescues and invasions by sea and air. It is 1936, and world events are overtaking the seclusion of the tiny country in the waters off the coasts of France and Spain, in the Bay of Biscay. The remaining FitzOsbornes are very aware of the political turmoil in Europe, especially the Spanish Civil War and rising fascism in Germany. 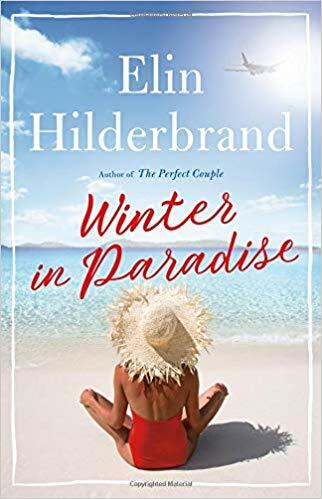 German soldiers land on the shores of Montmaray one day, as part of the historical/archaeological research wing of the Nazis, and life is never the same again. 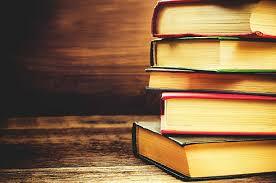 At the end of the first volume, there are still many mysteries to be solved. I can’t wait to hear more from this charmingly eccentric family. 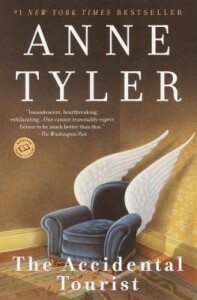 If you’re waiting for the new Anne Tyler, A Spool of Blue Thread, why not dip into the Tyler archive? Old friends like the charmingly odd Leary family are the center of The Accidental Tourist. Macon, the travel writer who hates to leave home, moves in with his siblings when he breaks his leg. Macon, along with Rose, Charles and Porter resume their comfortable routines, including a card game so intricate only the three brothers and sister can master it. Written in 1985, the absence of cell phones and answering machines allow Macon to leave his marital home and go off the grid. The Learys often ignore the ringing landline, so those looking for Macon are forced to show up at the door. Air travel prior to 9/11 is also charmingly free of TSA regulations. Macon writes a series of books for the business traveler, and the chief goal is to replicate one’s home environment. His desire for order and quiet set him up for a collision with Muriel, who is a dog trainer, among other things. She’s Macon’s equal in eccentricity – but on the other end of the spectrum. She’s outgoing and confessional, with considerably fewer boundaries than the Learys. Though the tone is sometimes comic, there’s an undertone of sadness and complexity. In the recent past, Macon’s son was killed in a shoot-out at a fast food restaurant. Muriel has had to struggle all her adult life to patch together a life for herself and her young son. Tyler’s gift is to create fascinating characters and then let them bounce off each other in unpredictable ways. 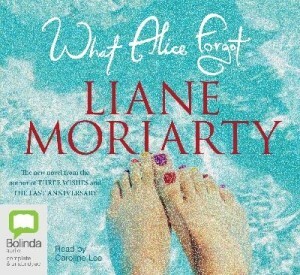 What Alice Forgot is a great novel for audio, due in large part to the wonderful narrator, Caroline Lee. Lee’s lilting, open Australian accent is critical to understanding Alice’s character. The 1998 Alice is wonderfully innocent, quirky and enthusiastically in love with her husband. The 2008 amnesiac Alice, who is living ten years in the past, is, in her own mind, still that person. She gradually begins to put together the puzzle of her new identity. To the listener, it’s almost like a mystery. You wonder who the new Alice is and how she got that way. Like Alice, you’re also relying on what people are telling Alice, and no more. Both Alice and the reader/listener are frustrated when it seems other people are withholding information. Liane Moriarty’s breezy style keeps the story light, while delving into the darker sides of Alice and her family’s journey over the last decade. Life has gone on; there have been births, deaths and marriages. Alice confesses to her sister that she has no idea how to feed and take care of her children, or any children for that matter. She speculates that a diet of sausages would probably be popular. Elizabeth, her older sister, is a great foil; she had always been Alice’s protector and support which allowed Alice to be the funny, spacey one. One of the mysteries is why they had grown apart. 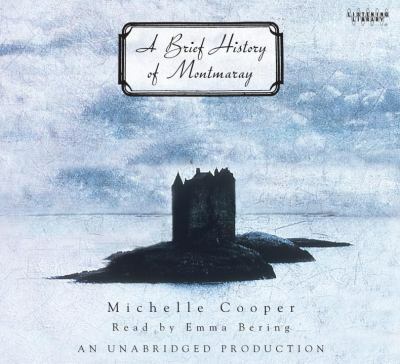 The many well-drawn characters make this rather long audiobook absorbing to the end. Claire Waverley has started a successful new venture, Waverley’s Candies. 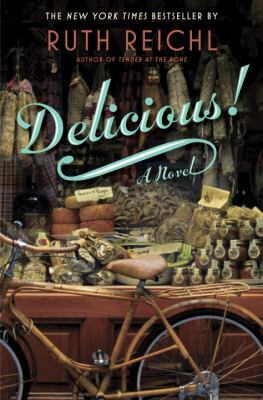 Though her handcrafted confections – rose to recall lost love, lavender to promote happiness and lemon verbena to soothe throats and minds – are singularly effective, the business of selling them is costing her the everyday joys of her family, and her belief in her own precious gifts. Sydney Waverley, too, is losing her balance. With each passing day she longs more for a baby – a namesake for her wonderful Henry. Yet the longer she tries, the more her desire becomes an unquenchable thirst, stealing the pleasure out of the life she already has. Sydney’s daughter, Bay, has lost her heart to the boy she knows it belongs to…if only he could see it, too. But how can he, when he is so far outside her grasp that he appears to her as little more than a puff of smoke? Longlisted for the 2014 National Book Award From the winner of the Pulitzer Prize : a powerful, engrossing new novel – the life and times of a remarkable family over three transformative decades in America. On their farm in Denby, Iowa, Rosanna and Walter Langdon abide by time-honored values that they pass on to their five wildly different children: from Frank, the handsome, willful first born, and Joe, whose love of animals and the land sustains him, to Claire, who earns a special place in her father’s heart. 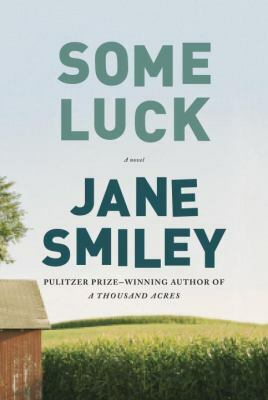 Each chapter in Some Luck covers a single year, beginning in 1920, as American soldiers like Walter return home from World War I, and going up through the early 1950s, with the country on the cusp of enormous social and economic change. As the Langdons branch out from Iowa to both coasts of America, the personal and the historical merge seamlessly: one moment electricity is just beginning to power the farm, and the next a son is volunteering to fight the Nazis; later still, a girl you’d seen growing up now has a little girl of her own, and you discover that your laughter and your admiration for all these lives are mixing with tears. “My father’s wife died. My mother said we should drive down to his place and see what might be in it for us.” So begins this remarkable novel by Amy Bloom, whose critically acclaimed Away was called “a literary triumph” ( The New York Times ). 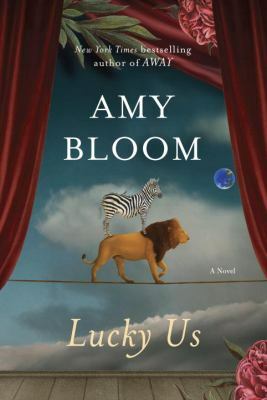 Lucky Us is a brilliantly written, deeply moving, fantastically funny novel of love, heartbreak, and luck. Disappointed by their families, Iris, the hopeful star and Eva the sidekick, journey through 1940s America in search of fame and fortune. Iris’s ambitions take the pair across the America of Reinvention in a stolen station wagon, from small-town Ohio to an unexpected and sensuous Hollywood, and to the jazz clubs and golden mansions of Long Island. With their friends in high and low places, Iris and Eva stumble and shine though a landscape of big dreams, scandals, betrayals, and war. 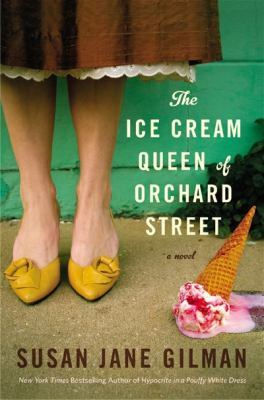 In 1913, little Malka Treynovsky flees Russia with her family in The Ice Cream Queen of Orchard Street. Bedazzled by tales of gold and movie stardom, she tricks them into buying tickets for America. Yet no sooner do they land on the squalid Lower East Side of Manhattan, than Malka is crippled and abandoned in the street.